Often when Allison puts out a call for material for the show, I’ll take a look at my installed Mac apps via Launchpad to see if there’s anything relatively new that’s worth a review. Faced with the prospect of sourcing an entire show, I did the same thing, but what I noticed was not something new. In fact, it’s a whole lot of somethings and they’re all quite old. There’s a folder on the default Launchpad configuration called “Other” which contains all 17 applications from the Utility folder that lives inside your Applications folder, plus 9 other applications that aren’t usually featured in Apple promotional materials. I thought it might be useful to listeners if I quickly ran through what’s in there and maybe you’ll discover something useful you didn’t know you had. First up, I’ll cover those applications that reside in the Utilities folder. We’ve come across some of these before, but I’m sure there will be at least one you didn’t know about. Activity Monitor can be useful if you want to figure out what’s happening on your Mac. In the days of spinning hard drives (OK, that’s still today for some) you’d sometimes hear your drive crunching away constantly and notice your system performance degrade. Looking in Activity Monitor can tell you what applications are reading from and writing to the drive. You can also see what’s using up your CPU cycles, your memory, your network bandwidth, and gauge which apps are consuming the most energy and therefore battery life if you are using a laptop. Airport Utility is the tool you need to set up your Apple AirPort router or Time Capsule device. Of course you’ll be familiar with this because you’re always installing updates when those blinking orange lights appear, aren’t you? Audio MIDI Setup is something most people won’t ever need, but has some of the more powerful options of macOS audio for you to fiddle with. It has three sections: Audio, MIDI, and Network. The Audio window is most useful as here you can create aggregate audio devices that combine audio from more than one physical device into a single one – useful for apps like GarageBand which insist on using only a single device. There are also fine grained controls of audio quality, volume and channel balance. The MIDI window will be useful for those who have MIDI devices attached. I’m actually not sure what the Network window does – presumably there are such things as network audio devices. Bluetooth File Exchange is probably of limited use today. With it you can send any file to another device over Bluetooth. I guess it could be useful for older style feature phones, but I’m struggling to see the utility of sending a file to my Magic Mouse. Boot Camp Assistant is where you go if you want to set up a dual boot copy of Windows on your Mac. It’s a wizard-style app which will take you through all the necessary steps. 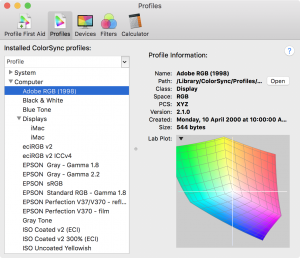 ColorSync Utility is a collection of tools for managing colour profiles on your Mac. For the most part these are best left alone, but for some professions, such as print design, colour management is vital. For the layperson, there are a few interesting aspects. You can click on each installed colour profile and see a 3D model of the colour space it covers, and there’s a “colour calculator” which you can use to convert, for example, RGB values to HSV values. Console is the tool for looking at the numerous log files that reside on your Mac. If you’re having serious or recurring problems with your Mac and don’t quite know what to blame, having a look in Console can sometimes give you a clue. Although, be prepared for a LOT of gibberish to go flying by! Digital Color Meter is a simple but useful tool if you’re trying to use colours in your documents or designs that are present in other places. It provides a small window that magnifies the screen area under your mouse pointer and shows you the colour values of either the single pixel or averaged across a larger square. Disk Utility is one many will have used to reformat a hard drive or SSD, or figure out why you’re getting errors about them and trying to fix them. Grab is a screen capture utility. It’s of limited use because there are keyboard shortcuts to do most of what it offers, however you can also do a full screen grab after a delay of 10 seconds. This can be useful when you want to capture transient items on the screen like a drag in progress. Grapher is a real gem but will only appeal to some people. 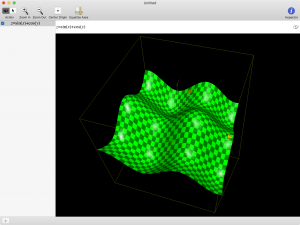 It is a simple graph plotter which will plot an equation in 2D or 3D space. In the case of 3D you can use your mouse to rotate the graph. Keychain Access gives you a view into all those secure items that macOS is keeping for you. Any time you ask macOS or Safari to remember a password, this is where it goes. It’s useful to open Keychain Access if you’re having troubles with a particular login so you can see exactly what has been remembered. It’s also the home of encryption and authentication certificates. Migration Assistant is the process you normally run on a new Mac during setup, but if you elect to skip it when prompted, you can always relaunch it to get assistance migrating data from one Mac to another. System Information is also available from the “System Report…” button in the “About this Mac” window. It is a detailed, hierarchical list of all of the hardware features of your Mac along with many software settings in a simple text-based output. If you want to know how fast your Thunderbolt and USB ports are, this will tell you. It’ll tell you what RAM you have installed, your optical disc burning capabilities, your native display resolution, and even list every USB device connected to your Mac. Terminal should be very familiar to you if you’ve been listening for any amount of time. The command line interface to macOS is not scary, now, is it? Now that Bart has tamed it for us in the Taming the Terminal series. VoiceOver Utility gives you an enormous amount of control over the wonderful VoiceOver technology in macOS. 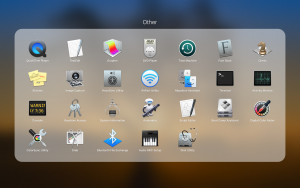 Now I’ll cover off the additional applications that appear in the Other folder in Launchpad. Automator is the very approachable way to automate stuff on your Mac. It uses a simple drag-and-drop interface to build workflows that can do anything from adding calendar items, to downloading images from a web page, to starting a Photos slideshow, and much, much more. This is worth having a play with. 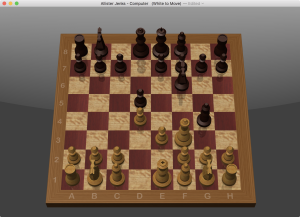 Chess is a pretty decent 3D chess game. It doesn’t have a lot of options, but you can play against your Mac or via Game Centre against anyone remotely. DVD Player is the basic DVD player app that by default launches when you insert a commercial DVD video. Font Book is the tool to manage all your installed fonts. You can see all of the font names, whether there are any issues (some third party fonts may be incomplete for example), delete them, install new ones, and see a sample of any font by selecting it. Image Capture allows for importing images from cameras and scanners. This is very much an Apple minimum viable application and you’re generally better off with with a dedicated photo management app, such as Photos, or the software that came with your scanner. But it does serve well as a backstop when you just need the basic functionality. QuickTime is Apple’s video player. It has limited support of different video types, but does have the incredibly useful ability to record your Mac screen, or a section of it, as a video. Again, it is a very limited application, but it has its uses. Stickies is a digital implementation of Post-It™ Notes. Try it! TextEdit is one you’ve probably all come across at some point, perhaps in the early days of following the Programming By Stealth series. Once again, it is a basic app that is useful up to its limitations. Time Machine is the app that lets you go through your Time Machine backups to locate and restore old files. Hopefully you found something of interest in that list. All of the mentioned apps are installed on every Mac by default, so your wallet is not at risk. I must, however, respectfully disagree with one synopsis: Image Capture. It is my go-to application for managing images outside of Photos. It provides a quick/nimble way of accessing, grabbing, and deleting photos in the iDevice camera roll (or attached camera or SD card), and gives me a first-class interface to my printers’ scanners — all without the need to add third-party crud. I consider Image Capture to be a hidden gem. A good memory jogger for future presentations at my local Apple User Group meeting Allister. I agree with Steve that Image Capture is my go to app for scanning and acquiring pictures, but I don’t use that app. I have Preview in my Dock and access Image Capture features via Preview > File > Import From… which give me access to all Image Capture controls. Preview is my got to gem. I’m sure Image Capture can do a great job at document scanning, but it doesn’t give me enough control of my Epson flatbed scanner. Weirdly, when I set it to transparency mode it majorly reduces my options. While I can do multiple item detection and 4800 dpi scans in flatbed mode, it takes those options away from me in transparency mode where they are most needed! There’s little point in scanning a 35mm negative at 360dpi, which is the most it will give me. I grant you it can pull images off most devices but I find iCloud or direct into Photos/Lightroom (especially directly from an SD card) do a fine job, too, so I really don’t have much need for it. That said, it has certainly improved a lot since I last tried it.